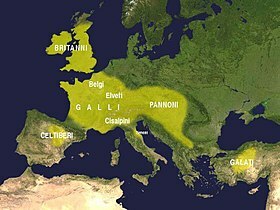 Cisalpine Gaul was the part of Italy inhabited by Celts (Gauls) during the 4th and 3rd centuries BC. Conquered by the Roman Republic in the 220s BC, it was a Roman province from c. 81 BC until 42 BC, when it was merged into Roman Italy. 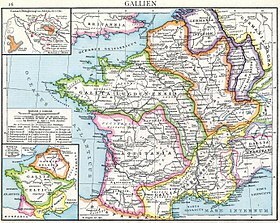 Until that time, it was considered part of Gaul, precisely that part of Gaul on the "hither side of the Alps", as opposed to Transalpine Gaul. This is a list of Celtic tribes, listed in order of the Roman province or the general area in which they lived. This geographical distribution of Celtic tribes does not imply that tribes that lived in the same general geographical area were more related. Some tribes' or tribal confederation's names are listed under more than one region because they dwelt in several of the regions. Alesia was the capital of the Mandubii, one of the Gallic tribes allied with the Aedui. The Celtic oppidum was conquered by Julius Caesar during the Gallic Wars and afterwards became a Gallo-Roman town. Its location was controversial for a long time. It is today considered to have been located on Mont-Auxois, near Alise-Sainte-Reine in Burgundy, France. The Gauls were a group of Celtic peoples of West-Central Europe in the Iron Age and the Roman period. The area they inhabited was known as Gaul. Their Gaulish language forms the main branch of the Continental Celtic languages. 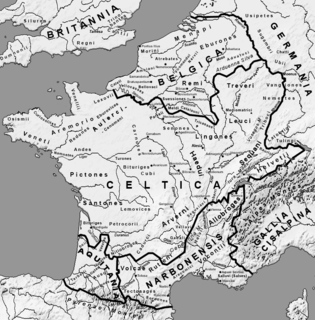 The Helvii were a relatively small Celtic polity west of the Rhône river on the northern border of Gallia Narbonensis. Their territory was roughly equivalent to the Vivarais, in the modern French department Ardèche. Alba Helviorum was their capital, possibly the Alba Augusta mentioned by Ptolemy, and usually identified with modern-day Alba-la-Romaine. In the 5th century the capital seems to have been moved to Viviers. 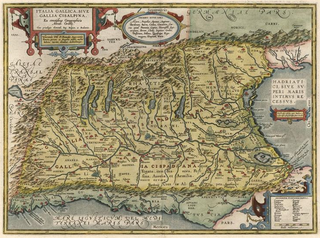 Gallia Celtica, meaning "Celtic Gaul" in Latin, was a cultural region of Gaul inhabited by Celts, located in what is now Switzerland, France, Luxembourg and the west bank of the Rhine in Germany.